Looking for an oral rinse that helps keep your mouth healthy without that alcohol burn? Check out our REACH Complete Care review to see why it may be a good fit for you! I received free REACH products and compensation for my time for writing this REACH Complete Care review, but all opinions are my own. When you’re in your early to mid-twenties, one of the last things on your mind to worry about is usually your health. Age is on your side, you usually are full of energy and can even eat most things you want still. So, color me super surprised when I had just started my own business, didn’t have dental insurance and discovered one day that a piece of one of my molars had broken off at the ripe old age of 25. It was a shock to me to have dental problems so young, especially since I thought I took pretty decent care of my teeth, and certainly inspired me to do even more in my dental care routine. So, today I am happy to share my REACH Complete Care review and hopefully remind you to encourage yourself and family to practice better dental care. REACH® has been a trusted brand for many years with a wide variety products. They usually offer more benefits, yet cost less than the competition. 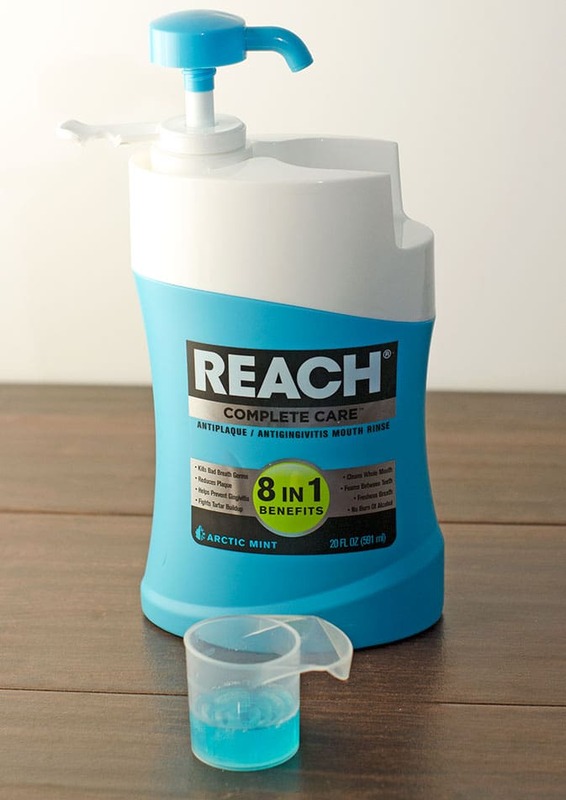 REACH® Complete Care™ Rinse has 8-in-1 benefits including killing bad breath germs, helping to prevent gingivitis, reduces plaque, fighting tartar build-up, and freshening breath without the burn of alcohol. Did you know that no matter how tired moms may be, a new survey by Kelton Global states millions of American moms put their teeth first, even over washing their face or removing their makeup before bed? That means about 82% of America’s moms brush their teeth every night. I thought that was a pretty cool statistic, especially since we seem to find out more information regularly that good dental health can help prevent health issues in other parts of our bodies. So how does REACH complete care help you have the best dental health possible? First off I have to say how much I admire the packaging of the REACH Complete Care rinse. I have used a variety of rinses in trying to find what works best for me and some are ultra messy. One in particular I remember was handy enough to squeeze out the exact amount you should use, but it would also tend to leak and leave a very unpleasant green sticky mess all over the bottle that would then spill under the container and onto the counter. Yuck. REACH, on the other hand, has a very clever system because it has a built-in pump in the bottle that goes right into the cup that comes with the system. So, all you have to do is pump out the rinse into the cup, use it, give the cup a rinse and place it back into the holder on the bottle without any mess. I also found the bottle to be pretty cool because it has a bar that can swing out that you can hang your toothbrush on to reduce clutter on your bathroom counter. I first used the REACH rinse after having lunch and was pretty impressed with how it worked. Some rinses I’ve used before don’t help much with getting unseen small particles of food unlodged from your teeth, but REACH definitely got a few potato chip particles I didn’t even realize were there. 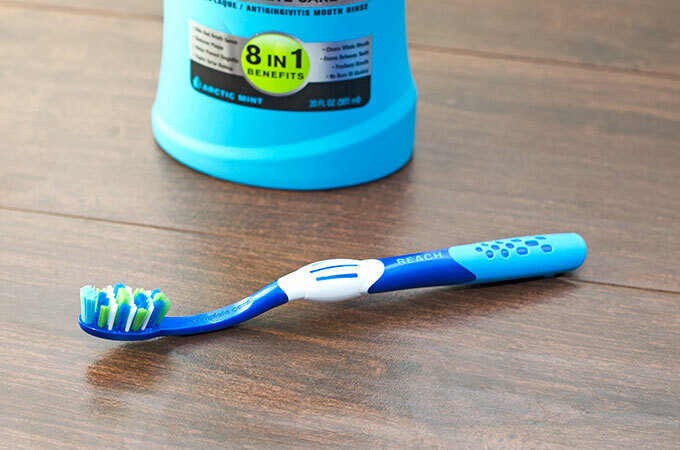 While the rinse isn’t overly foamy, you can tell that it foams a bit to really help get between your teeth. It also tastes fine, and you get more of a minty note as you continue swishing the rinse around your mouth. Plus, there’s also not an alcohol burn that has you trying to make 30 seconds as fast as possible because it’s so uncomfortable. With REACH I had no problem swishing for the whole 30 seconds. After using it, my teeth and mouth overall felt clean and minty fresh. I like that the mint flavor of the Arctic Mint flavor lasted for quite a while because mint is one of my favorite flavors and it also helps your mouth feel cleaner. Plus, my teeth stayed pretty plaque-free even though I had sugar until I went to brush and rinse my teeth right before bed. While I do usually use an electric toothbrush, I’ve been keeping the REACH toothbrush in the downstairs bathroom to brush after lunch and I absolutely love the curve of the brush. I have an underbite, and the curve definitely makes it much easier to thoroughly brush my back teeth. Will REACH Total Care Stay on My Bathroom Countertop? 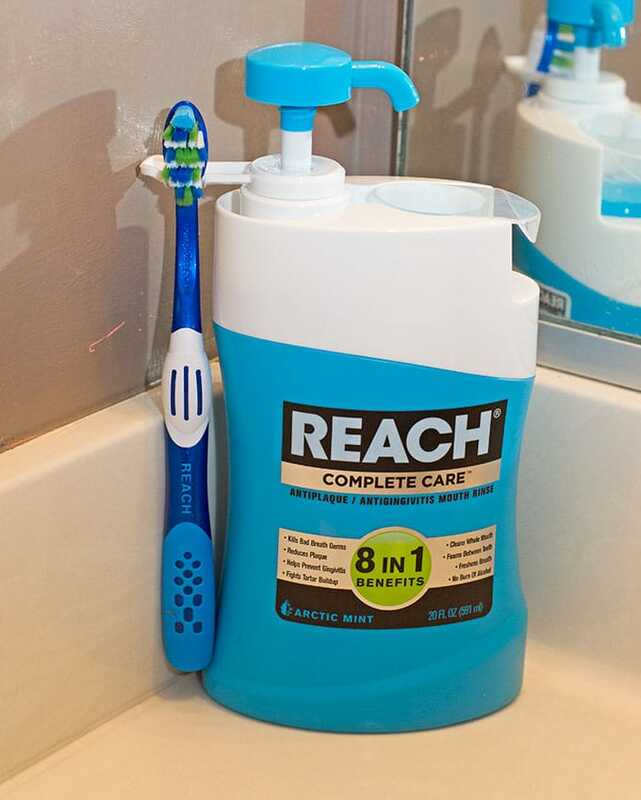 I’ve enjoyed using REACH Total Care rinse and love the really clean feeling it gives my teeth and mouth so I will definitely be keeping it on my countertop to continue using! Now that you’ve read our REACH Complete Care Review will you be giving REACH a try?